Making history when she became the first woman in two decades to take two consecutive national road race titles, Gracie Elvin outsprinted Lauren Kitchen (NSW) and last year’s Subaru National Road Series winner Katrin Garfoot (QLD) at the end of the 102 kilometre women’s race today. 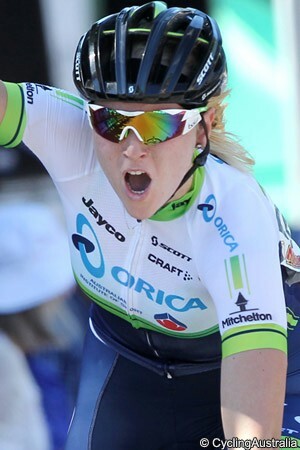 Elvin’s success was the third straight road champs win for her Orica GreenEdge team, with Amanda Spratt winning two years ago. “I’ve been watching cycling for as long as I can remember, so it means a lot to me to really see my dreams come true,” Elvin said at the end of the race in Buninyong. She fell in the critierum championships on Thursday but showed little signs of that today. One of the day’s main aggressors was Lisa Jacobs (VIC), who attacked at the bottom of the second King of the Mountains climb and build a lead of over three minutes. Bridie O’Donnell (VIC) and Jessie Maclean (ACT) tried to get up to her but they were hauled back three laps from the end. Elvin then jumped ahead solo and caught Jacobs inside the final 25 kilometres. However she was herself reeled in by Tiffany Cromwell (SA/Specialized lululemon) and Garfoot with fifteen kilometres left. In turn, they were caught by the chasing group and a fatigued Elvin and Kitchen both lost contact on the final climb. They knuckled down to chase, while ahead Cromwell, Garfoot, Under 23 rider Emily Roper (QLD), Amanda Spratt (NSW) and Shara Gillow (QLD) went over the top together. Elvin said that Kitchen was important in her getting back up. “I was holding on for dear life on that last climb. I just couldn’t do it,” she said. “I was with Lauren and was thankful she dragged me back. Elvin won the final gallop against Kitchen, Garfoot, Cromwell, Spratt, Roper, Miranda Griffiths (VIC) and Jenelle Crooks (QLD). “We (ORICA-AIS) were trying to stay calm this morning and we had a good plan and I think we executed it pretty well today,” said Elvin. “We just stayed patient, it is a hard race so you have to show your cards late and I think that’s what we did and I’m really happy with the team. I just want to say, thanks to my teammates, this jersey is for them,” added Elvin. Roper took the under 23 gold medal, finishing two places ahead of Crooks. Jessica Mundy (SA) took third. She finished second in the TT earlier this week, and drew on that today. “I went into the time trial and I didn't really know how I really was going to go. I ended up second there by three seconds, so that gave me a bit of a drive for the criterium and the road race. I definitely came out here and just gave it all I got and I’m happy with the result. 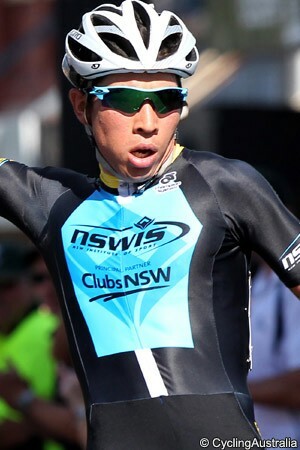 Caleb Ewan further boosted his reputation as a rider to watch for the future when he triumphed in the under 23 men’s road race, adding to the criterium gold medal he took two days ago. Runner-up Power was generous in his praise of the winner. “I gave it my best and this guy [Ewan] put on a show as always. Anytime I get to race with him is awesome,” he said. Early on five riders went clear on the second lap. Jason Loundes (VIC), Michael Crosby (VIC), Mitchell Cooper (VIC), Samuel Wood (QLD) and Jeremy Cameron (VIC) built a lead of over a minute and a half, but were reeled in 48 kilometres from the line. A succession of breaks followed, then in the final twenty kilometres the key move went clear. With one lap to go, Ewan was in a six man group with Carpenter, O’Callahan, Hamilton, Alex Clements (TAS) and Robert McCarthy (SA). Linfield and Power then joined up over the top of the climb. They were aware of Ewan’s speed and made multiple efforts to get clear without him. However Ewan and the others covered each move, bringing it down to a gallop which the future Orica GreenEdge rider won. He admitted afterwards that he was suffering a lot on the final lap. “The last time up that climb I was cramping the whole way. I just had to make it look like I wasn’t going that hard when they attacked me,” he said. “It was quite aggressive on the last climb. I was able to cover all the moves…I knew if I covered all the moves and I got to the finish with the whole bunch that I would have a good shot of winning the kick. The Elite men’s road championships will follow on Sunday, with riders such as Cadel Evans (BMC Racing Team), Richie Porte (Sky), former champion Simon Gerrans and last year’s winner, his Orica GreenEdge team-mate Luke Durbridge all set to take part. The field has been described as the strongest-ever for the event.